This guide will show you how to get started as quickly as possible with the Web SDK from Zendesk Chat. 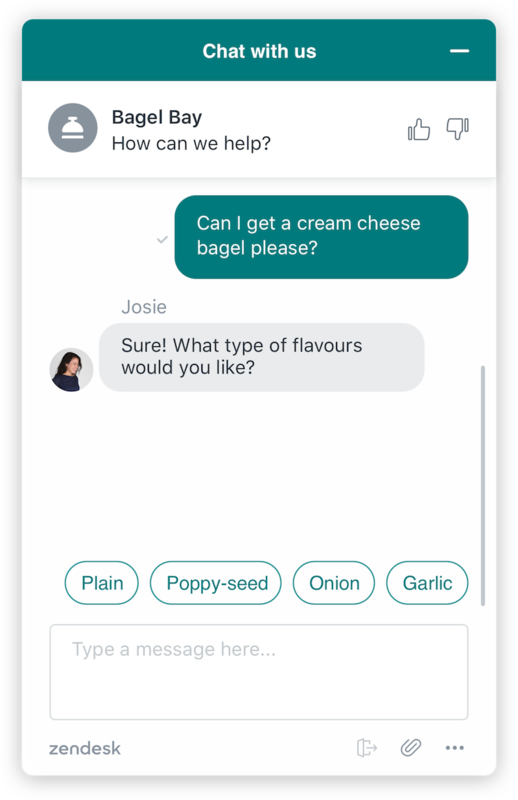 The Web SDK will give businesses and developers the flexibility to build and customize a chat experience that meet their specific design/brand requirements. To use the SDK, you will need to know web development or have access to developers that can help you build and maintain your custom widget. To use the Web SDK, you will need a Zendesk Chat account on the Enterprise or Premium (Legacy) package. To sign up for a free trial, click here. Note: By using the Web SDK, you agree to Zendesk's Master Subscription Agreement and API License Agreement. The sample application is built using React. Please refer to the README to set up the sample application. The Web SDK will automatically handle the heavy lifting of maintaining realtime connection with the Zendesk Chat servers as well as taking care of visitor's session for you. It provides a list of events and convenient methods so you can focus on building a highly customized chat UI. When building a custom widget using the Web SDK, the browsers and browser versions that are supported is up to you. However, the Web SDK does require a connection with Transport Layer Security (TLS) 1.2 or above. Older browsers or devices that do not support TLS 1.2 will cause the Web SDK to not initialize properly. To see what browsers support TLS 1.2, please look at the following link. To learn what are the general system requirements for Zendesk Chat and the standalone Chat widget, click here. By default, each Zendesk Chat account comes with a default Chat Widget. The appearance and behavior of the Chat Widget can be set through the Zendesk Chat dashboard. If you decide to build a custom chat widget using the Web SDK, any appearance-related settings for the Zendesk Chat Widget will not be reflected on your chat widget. You are also expected to write your own code to customize the design of the chat widget. 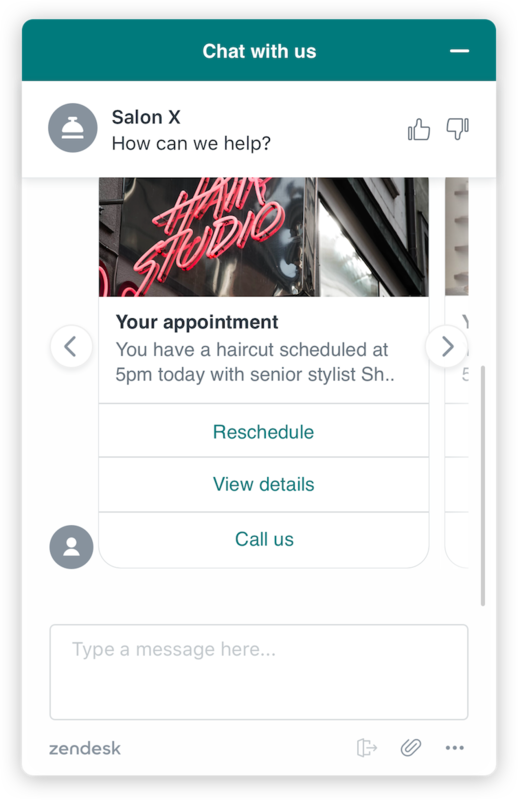 The Web SDK and the Zendesk Chat Widget can be used in conjunction with each other. Zendesk Chat Widget's settings will not affect the custom chat widget built using the Web SDK. The Web SDK maintains a convention on the naming and behavior of the API methods. The getter methods will synchronously return the latest confirmed information about the requested topic. On the other hand, the setter methods are asynchronous and follow the Node.js callback style. It accepts an optional callback, which informs you if the API method has been executed successfully. Refer to the Error Handling section for further details. A full list of API methods can be found under API Methods. The Web SDK also provides an event registry where you can listen to specific events when they occur. A full list of events we support can be found under Events. There are three types of errors which can occur while using the SDK. The first type is the validation error. A validation error occurs when API methods are called with parameters which do not conform to the desired format. For example, this can occur when a Number value is passed to an API method which requires String as its parameter type, or when an invalid email is used when invoking zChat.sendEmailTranscript(). When this occurs, the error message related to the API method will be output to the browser's console. Usage of an invalid Zendesk Chat account key can also result in validation error. To avoid this type of errors, be sure to refer to the API Methods section for the required type and description for each parameter. When an API method is invoked successfully, the err parameter will always be null. Otherwise, it will point to an Error object. The third type of error that can occur is when the structured message payload received via the 'chat.msg' event is not supported by the correct Web SDK version. A chat participant is someone who has participated in a chat session either by joining the chat session or sending a chat message. This includes both the visitor and agents. A chat participant is identifiable by a unique string property known as nick. For visitors, the nick property will be 'visitor', and for agents it will be in the format of 'agent:<agent-id>'. In the case of a trigger sending chat message, the nick property will be 'agent:trigger'. The download URLs for the current and previous releases can be obtained from the Downloads section. In the rest of the documentation, we will refer to zChat as the imported Zendesk Chat Web SDK object. Always ensure that you initialize the SDK before using any of the API methods. In the above example, JWT_TOKEN_ENDPOINT is an endpoint which can be implemented on your own server to obtain a fresh JWT for the particular visitor. You may refer to the Creating a JWT token section in this Help Center article for additional information on how you can create your own JWT token. Certain API Methods may not be available for authenticated visitors or may be available but with reduced functionality, you may find such information under the description of these affected methods. To log out an authenticated visitor, call zChat.logout(). This will close the connection to the Zendesk Chat server and you will need to re-initialize the Web SDK to establish connection again. With the Web SDK, your visitors can chat with your agents in realtime or send offline messages. A chat is a conversation between the visitor and one or more agents who will be communicating with the visitor. To start a chat, the visitor or an agent needs to send the first message in the chat. When this happens, a 'chat' event of type chat.memberjoin will be fired indicating the the participant who has joined the chat (the participant who sent the first message). When an agent starts a chat, the visitor will also automatically join the chat. This will result in two chat.memberjoin events being fired, one involving the agent and the other involving the visitor. To send a message, use zChat.sendChatMsg(). Our Web SDK allows you to send offline messages so that you do not miss messages from your visitors. Use zChat.sendOfflineMsg() to send an offline message. A chat session is ended whenever the visitor leaves the chat. This can also be triggered programmatically using zChat.endChat(). When the visitor has no activity (mouse movement, key presses) in 20 minutes, the visitor will be disconnected and any ongoing chat will be ended. Typing indicators allow the visitor or agents to know that the other party is currently typing a message. To inform the agent that the visitor is currently typing, use zChat.sendTyping(true). Similarly, use zChat.sendTyping(false) to inform the agent that the visitor is not typing. You can update this timestamp by calling zChat.markAsRead() when the visitor interacts with your custom widget, for instance when the text area is clicked, chat log is scrolled to the latest message, etc. This allows you to synchronize unread message counts for the same visitor across multiple tabs, as well as for authenticated visitors across multiple devices. Visitors can request for the chat transcript to be delivered to their email address. The chat transcript will be sent to the visitors when the chat session ends. To do so, use zChat.sendEmailTranscript(email), passing in the visitor's email. Ensure that you only allow the unauthenticated visitors to request for chat transcript while a chat session is still active. For authenticated visitors with past chats, this method will schedule an email containing the transcript for the most recent conversation. Visitors can give feedback to agents before the chat has ended. Currently, visitors can rate a chat or leave a comment. Once again, ensure that you only allow the visitor to rate or comment while a chat session is still active. The Web SDK also supports sending and receiving of file attachments during chat. This feature is only available if you have the File Sending settings enabled in your Chat dashboard. The size of each file attachment sent cannot exceed 5MB. Attachments successfully sent by others will be broadcasted as a chat event. Listen to 'chat' events of type chat.file to get more info. 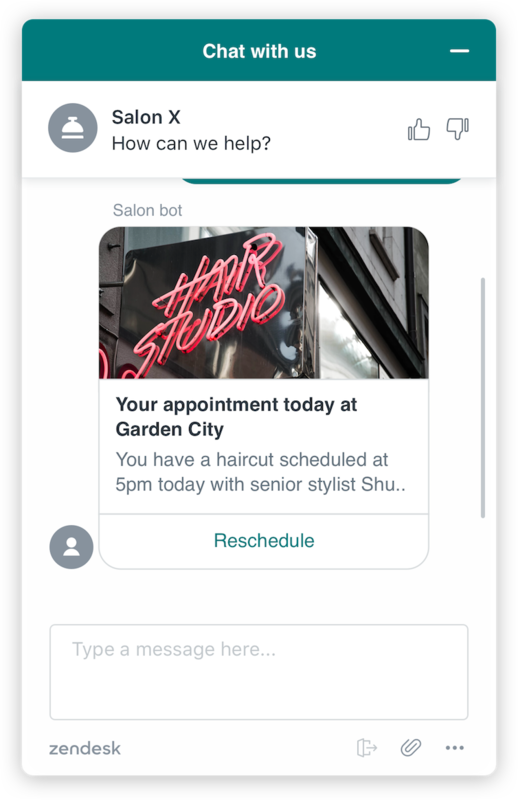 Structured messages are message templates that allow you to provide a richer messaging experience than just pure text. By incorporating new elements such as one-time-use quick reply buttons, persistent panel templates with embedded pictures, and different button actions, you can use templates for many purposes. Examples include e-commerce goods recommendation, content recommendations, option selections, and service scheduling. Where is the structured message payload? The payload can be found in structured_msg property under the 'chat.msg' event. What types of structured messages are currently available? Quick Replies allows a message to be sent with an array of options for a end-user to choose. Once an option is selected, it can be sent as a reply. A Panel Template allows a message to be sent with a panel (containing image, title, subtitle) and a list of options as buttons. A Panel Template Carousel allows a message to be sent as a carousel of Panel Template. A List Template allows a message to be sent with a list of items (containing image, title, subtitle) and a button. How can you send a structured message? Structured messages can only be sent via Chat Conversation API. If your current Web SDK version does not support newer structured messages types, an 'error' event will be emitted. Consider upgrading to the latest Web SDK version. Please check the schema of the structured message payload for the correct Web SDK versioning support. This section contains a comprehensive list of the API Methods and Events supported by the Web SDK. The zChat object comes with multiple API methods to send and retrieve chat data. action methods (e.g. .setVisitorInfo()) accept Node.js style callback function. getter methods (e.g. .getVisitorInfo()) return values synchronously. .on(), .un() are main methods to register/de-register realtime chat events. Initializes visitor session and creates connection to Zendesk Chat servers. Refer to the Initializing the SDK section for details on how to obtain your Zendesk Chat account key. Returns the current status of the account. This is a convenience getter for the account_status event. This is a convenience getter for the connection_update event. Returns the information of the current visitor. This is a convenience getter for the visitor_update event. For authenticated visitors: The callback will receive an error when name or email is provided. You can set the email and phone properties in the options object to '' (empty string) to remove the value. Setting the display_name property to '' (empty string) will result in the visitor being assigned an automatically generated display name (e.g. Visitor 12345678). Sends out the visitor's path to the Zendesk Chat server. This is used to track the visitor's navigation history on your website. It will appear as if the visitor has open a new web page, especially useful for single-page apps. This will affect triggers which have conditions set to check the visitor's page information (visitor page path, title, etc). When you invoke zChat.init(), the Web SDK will automatically send out the current path of the visitor to the Zendesk Chat server. Returns the visitor's queue position. If the visitor is not in a queue, this will return 0. Returns an array of the account's departments. This is a convenience getter for the department_update event. Returns the information of a particular department based on the given ID. Returns the ID of the current visitor's default department. If the visitor's default department is not set, this will return undefined. Set the current visitor’s default department. If the default department is set after chat has already started, it will only take effect on the next chat. Clears the current visitor’s default department. This will only work before the chat starts. Sends a chat message from the current visitor. This should only be used when the account is online. If this method is used when none of the agents are available to pick up a chat, messages sent by visitors may result in missed chats. Sends a file attachment from the current visitor. The zChat.sendFile() method is subjected to account's File Sending settings. Refer to our help article to modify the list of allowed file types or enable/disable the feature. The size of each file attachment sent cannot exceed 20MB as of v1.1.4. The previous limit was 5MB. When the API fails to complete successfully, an Error object will be passed to the callback function. The cause of failure can be determined from the error's message property, i.e. err.message. Sends a single offline message from the current visitor. This should only be used to send offline messages to an offline account or department. Adds new visitor tag to the current visitor's session. All tags will be automatically converted to lowercase. Removes existing tag from current visitor's session. Adds new visitor tag(s) to the current visitor's session. Removes existing visitor tag(s) from current visitor's session. Sends the visitor's current typing status to the agents. Set is_typing as true to indicate that the visitor is currently typing and false otherwise. Returns the visitor's rating and/or comment for the current chat. If the rating or comment is not available for the current chat, the value of the respective property will be null. Sends the visitor's rating on the chat experience. Sends the visitor's comment on the chat experience. Returns a boolean value indicating if there is an ongoing chat with the visitor. Returns an array of chat log messages in the current chat channel. This is a convenience getter for the chat event. Refer to chat event for the payload formats of the possible message types. Returns an array of information about the agents who are currently serving in the chat. This is a convenience getter for the agent_update event. Concierge information for triggered messages will not be in the returned list of agents. Returns an account's operating hours. If the account's operating hours have never been set, this will return undefined. Schedules an email containing the chat transcript to be sent to email when the chat has ended. This method can still fail for authenticated visitors if the visitor does not have past chats. Fetches past chats for an authenticated visitor. This method is only available to visitors who are authenticated via JWT. Upon calling this method, a request will be made to the server to retrieve the chat history of the visitor. This API method is paginated internally - this means that the Web SDK maintains a cursor that points to the last chat item which was fetched. When this method is invoked for the first time, the cursor is not set and will fetch chat items from the immediately preceding chat. Successive calls to this method will fetch older past chat items until there are no more items to be fetched. The cursor is reset on page reloads or when the Web SDK is re-initialized by invoking zChat.logout() followed by zChat.init(). When this method is executed successfully, up to 20 past chat items are emitted via the history event in a reverse chronological order (most recent to least recent). The callback will then be invoked to signify that the request has completed and provide information about the number of items fetched and if there are more items to be fetched. When the has_more property of data returned in the callback is false, you should not invoke this method again as it will lead to error. Additionally, this API method only supports 1 concurrent request at one time. Ensure that you wait for the callback to be invoked before calling it again. Updates the last read timestamp with the current server timestamp. This method only works when a chat is in progress. Calling this method will also cause the last_read event to fire. Reconnects the visitor's connection when it is disconnected due to idle timeout or intermittent connection. Logs out an authenticated visitor. This method is not available to visitors who are not currently authenticated via JWT. Upon calling this method, the connection will be closed. You will receive a connection_update event with the closed state. Most APIs will not be available and will result in error after logout until the Web SDK is re-initialized. The custom widget should also prevent further user actions which can result in invocation of the Web SDK APIs until the re-initialization happens. If you want to re-initialize the Web SDK, ensure that you call zChat.init() again. This section contains a comprehensive list of the constants exposed by the Web SDK. The Email parsing Regex object used to validate all email strings provided to the Web SDK. There might be additional validation layers in the backend which will be surfaced via the err callbacks. Realtime chat events will be emitted via zChat object. Use zChat.on() and zChat.un() to register event handlers. Register an event handler to an event type. The handler will have the signature function(event_data). De-register an event handler from an event type. This event will be fired when the account's status changes. This event will be fired when the connection to a Zendesk Chat server changes. This event will be fired when status of any department changes. This event will be fired when visitor's information changes, for instance when the visitor joins the chat. This event will be fired when an agent's information changes, for instance when an agent joins the chat. Chat triggers will not cause this event to fire. This event consists of all events which are related to the ongoing chat. The event_data passed into the handler will contain a type property to indicate the specific type of chat event. Depending on the value of the type property, the event_data objects will have different structures. Furthermore, the event_data also contains a nick property to indicate whether it is a visitor or an agent who has triggered this event. For more details on the format of the nick property, refer to Chat Participants. This chat event will be fired when a chat message arrives. The event_data will have its type property set to 'chat.msg'. Chat messages which are sent by the same zChat instance using zChat.sendChatMsg will not trigger this event. Instead, you can rely on the callback function of zChat.sendChatMsg to determine if the message has been succesfully sent. structured_msg Structured Message Structure message payload. Supported in SDK version 1.6.0 or later. See Structured Message. Please note that the support of different structured message payload and its schema depends on the Web SDK version. This chat event will be fired when a new chat attachment is appended to the chat log. The event_data will have its 'type' property set to 'chat.file'. The 'chat.file' chat event from chat history can potentially contain a `deleted` property that indicates that an attachment has been deleted. metadata Metadata | undefined See below for more information. This chat event will be fired when the visitor is put in the wait queue if the agents are currently at their capacity. The event_data will have its type property set to 'chat.wait_queue'. The visitor's position in the wait queue is not dynamically updated, i.e. this event is only fired once when the visitor first joins the queue. Furthermore, this event is not persisted across page changes and refreshes. This chat event will be fired whenever the visitor's queue position is changed. The event_data will have its type property set to 'chat.queue_position'. queue_position Integer The position of the visitor in the wait queue, or 0 if visitor is not in queue. This chat event will be fired when either the visitor or the agent joins the chat. The event_data will have its type property set to 'chat.memberjoin'. This chat event will be fired when either the visitor or the agent leaves the chat. The event_data will have its type property set to 'chat.memberleave'. This chat event will be fired when the agent requests for rating from the visitor. The event_data will have its type property set to 'chat.request.rating'. This chat event will be fired when the visitor updates the chat rating. The event_data will have its type property set to 'chat.rating'. This chat event will be fired when the visitor updates the chat comment. The event_data will have its type property set to 'chat.comment'. This chat event will be fired when the agent starts or stops typing. The event_data will have its type property set to 'typing'. This event will also be fired before and after a message is sent by a chat trigger. This chat event will be fired when the last read timestamp is updated. The event_data will have its type property set to 'last_read'. This event consists of all events which are related to chat history. This event will be fired when a validation error occurs. Refer to the Error Handling section for further explanation on validation errors. The Error object has additional properties to indicate the method which triggered the error as well as any extra information on the error. See below for the expected format. For the latest version, download it from https://dev.zopim.com/web-sdk/latest/web-sdk.js. Fixed connection issues in Internet Explorer 11. Improved performance when used across page navigations and with multiple tabs/windows. Added new List Template type for structured messages. Made authenticated visitor flow more friendly with CSP. Updated zChat.sendOfflineMsg to support empty phone field. Updated zChat.reconnect so that it only works when connection status is closed, otherwise it is a noop. The Web SDK has always been attempting to reconnect without any user intervention for all other statuses, for example: network outage. Visitor banned status is now remembered for a short period, subsequent zChat.init will be a noop for the duration. Fixed zChat.EMAIL_REGEX where it was previously throwing error when called. Added zChat.markAsRead and last_read chat event type. For more details, refer to the Last Read Timestamp section in Guide. 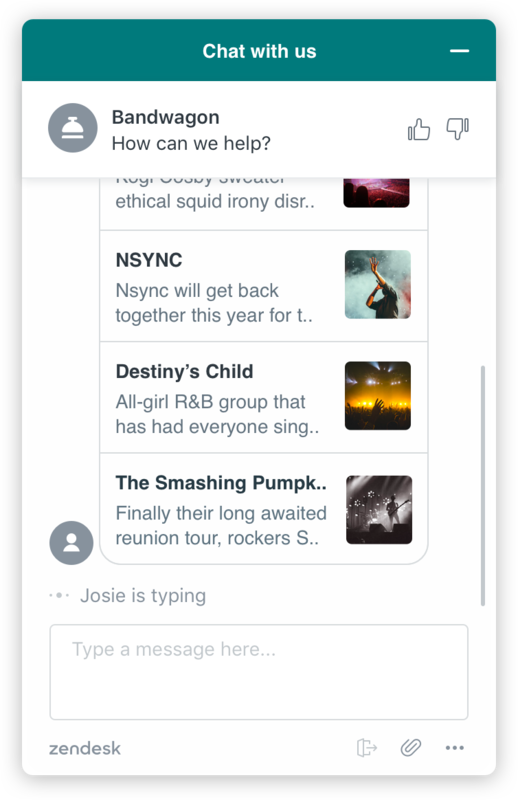 Added new Panel Template Carousel type for structured messages. Added support for structured messages. Added zChat.addTags and zChat.removeTags for bulk addition and removal of tags. Existing APIs for manipulating tags zChat.addTag and zChat.removeTag are deprecated and will be removed in future releases. Updated zChat.sendOfflineMsg to support phone field. Added ability to retrieve chat history via zChat.fetchChatHistory() for authenticated visitors. Added ability to authenticate visitors via authentication option in zChat.init() and log out visitors via zChat.logout(). Added zChat.EMAIL_REGEX constant to expose Email parsing Regex object. Added additional context in the 'error' event. Added metadata property in 'chat.file' chat event to possibly include dimensions for image attachments. Updated zChat.sendEmailTranscript to allow authenticated visitors with past chats to request for email transcript. Removed callback parameter from zChat.sendTyping. The connection_update event will now be triggered and set to 'connecting' when the connection is disrupted. This makes it clearer that the SDK will always attempt to re-establish connection with the server when disconnected. Deprecated chat.wait_queue chat event type. It will eventually not get fired anymore. Added chat.queue_position chat event type and zChat.getQueuePosition(). Increased maximum file upload size from 5MB to 20MB. Minor stability and reliability fixes. Performance improvements and more bug fixes. Added sendFile API to support sending of file attachments. Fixed a bug where zChat.setVisitorInfo() was not setting visitor display name correctly.